How are things going up there in Juneau? It's been a while, hasn't it? Last time I saw you, leaning against boxes in that dark storage unit, you looked a little forlorn. I thought I'd take the time to drop you a line and say hello. I hope it cheers you up. 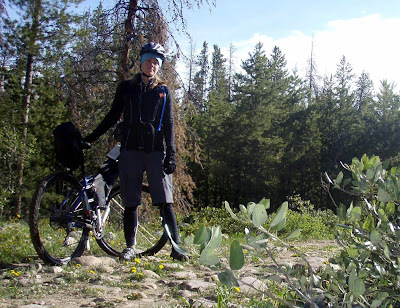 As you know, I've been down in the States, trying to wrap my head and legs around this whole summer biking thing. It's hard! Much harder than I anticipated. When you swerve out of control down a patch of scree, there's nothing soft on the ground to cushion the blow. And everything around here is bumpy. We're talking boulder fields that could break teeth (and spokes and derailleurs.) But for the most part, it's been going well. Just this past weekend, I took an overnight trip to the Uintas. You would have liked it there, Pugsley. 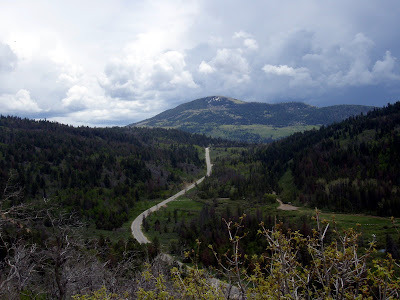 I left Heber in the early afternoon on Sunday, climbed to Kamas and aimed at getting over the pass on Highway 150. I was hoping to connect with some gravel and work my way down to the Weber River. The pavement just climbed and climbed and climbed, right into a down-canyon headwind. Now, I know how much you adore climbing (Ha! Remember the last time we climbed Eaglecrest? I think you tried to roll backward.) But I could have used you near the top. The pavement was getting precarious. 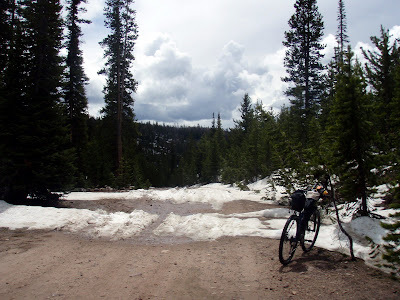 I hit the end of bikeable road at about 10,700 feet. 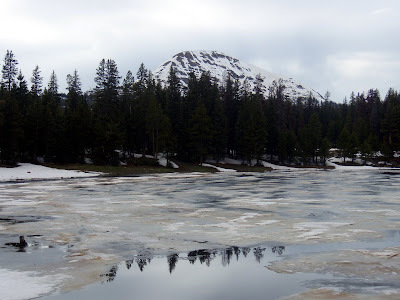 Temps had been pretty cold and the once-groomed snowpack was just crusty enough to allow fairly easy travel on foot. Kim's tires, on the other hand, just wanted to dig in. I kept thinking, "If only I had Pugsley, I could probably summit this pass and drop down the other side." It probably would have turned into a slushy postholing nightmare. It was, after all, the last day of May. 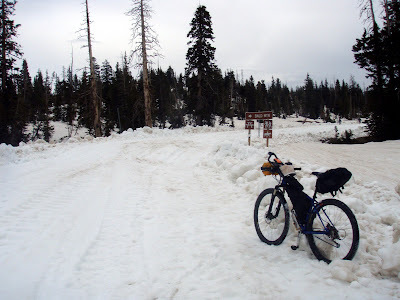 But as I looked into an expanse of white, I missed snowbiking. And I missed you. Anyway, Kim and I had to turn around and form a new plan. My map showed six forest roads and trails heading north off 150, and I decided to try them out and see what I could find. "Break up" is happening in full force up in the mountains right now, which means nearly unlimited sources of water ... and mud. I could have really used you on some of those forest roads. Sticky, gloppy muck occasionally grabbed my wheel, but I could usually find a way to steer around it. 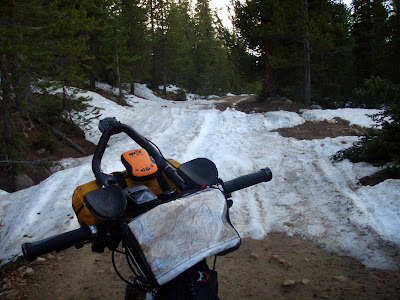 And, of course, once we were high enough, all roads ended in snow. It was pretty much a given ... at about 9,000 feet, patches of snow started to interrupt the gravel. 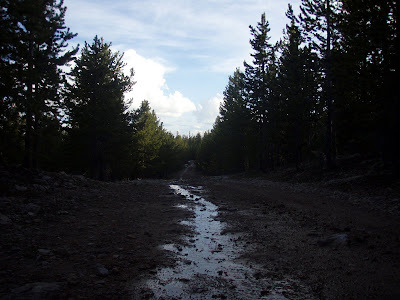 By 9,500 feet, the roads were impassable. As I moved down the highway, I had to climb further to reach the dead end. But it was always there, in some muddy unscenic spot, just waiting to mock me and the 2,000 feet of effort I had just wasted. It wasn't all a waste, though. While looking for a lake that I never found (probably took a wrong turn or several in there somewhere), I stumbled across a great campsite next to a swollen creek. You would have been so proud of me, Pugsley - I managed to start and sustain my own raging campfire (Remember that time I spent an hour trying to light some frozen twigs next to Herbert Glacier? Ha!) This time, I didn't even need fire to survive, and I built one anyway! It felt so luxurious. In keeping with my theme of simple gas station foods as a source of bike trip calories, I ate Corn Nuts, peanut M&Ms and CarboRocket for dinner by the fire. It was delicious. Now, I don't need your nutrition lectures, Pugsley. People cook up fancy freeze-dried dinners on their stoves and still get the same calories, carbs, fat and protein, but they need to carry and prepare all that crap. Keep it simple. You taught me that. Temps were cold that night. I saw 37 on the thermometer before I went to bed. It likely dropped to freezing before sunrise. I know to you that sounds warm, but I'm traveling much lighter down here. I have a sleeping bag that's only rated to 32 (positive!) and didn't know how well it would perform on the margins. I'm pleased to report that it worked beautifully. I slept eight and a half solid hours and likely snored the whole time. I probably would have slept even longer, but this young buck wandered into my camp and wouldn't leave. He approached within a few feet of my bag while I was snoozing. I went into full-on "bear" mode, jolted upright in a near-panic and looked right at him. He hardly even flinched. It was almost as though he was just curious about me. Now, don't be jealous, Pugsley. When I say young buck, I mean he was actually a deer. You know you're still my one and only. Morning brought more forest road exploration. 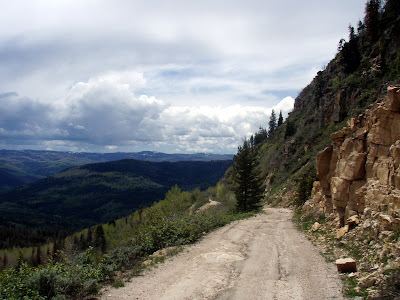 Man, these Uinta roads are rough. I could have really used you, Pugsley. When you and I go mountain biking, we can just monster-truck over everything and not even break our line. With the skinny tires, I have to display a lot more finesse. A lot more than I have. Front suspension and all. I did a lot of walking on the uphills. A lot more than I needed to. But then, you know all about hike-a-biking, Pugsley. I think even you'd admit that it's a nice break from the constant turning of pedals. Still, I'm getting more comfortable every day. Don't fret, Pugsley. I will eventually return to the land of rain and snow. But I remain in awe of Utah's sweeping beauty, in all of these places that until now where vague images from a distant past. 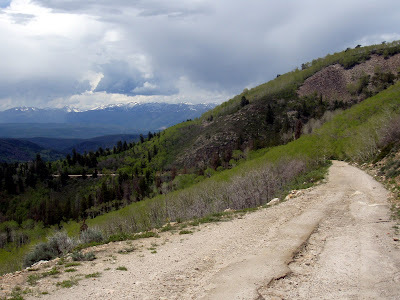 I love the desert, but I still think Utah saves its best for the high country. Maybe it's because the alpine is so similar - sometimes achingly so - to Alaska. With the exception of being dead-ended on every route I tried, the overnight ride went beautifully and I got everything I needed out of it. I was rained on several times, enough to soak my outer layer and show me that I can keep myself warm and my sleeping gear dry in wet and cool conditions. I slept out in near-freezing temperatures. 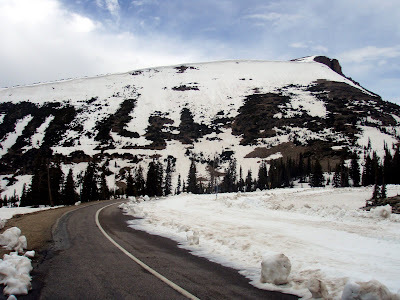 I pedaled my way to near 11,000 feet and didn't pass out, although I have to admit I was wheezing. I ended with about 140 miles of pedaling, 12,000 feet of climbing, 30 pretty pictures, 12 hours of luxury camping with my bivy and a bold young buck, all in the span of just over 27 hours. The day went by amazingly fast. I just rode my bike and everything else fell into place. It was a tough ride but not overly so. I went out for 10 more miles with my friends in the evening. I could get used to this lifestyle, and maybe I'll have to. Either way, I'll have to return to real life someday. I hope until then you don't collect too much dust. Winter will be here before you know it. Hi Jill, you look in great shape- lean and mean for the GDR!!! The Surly is a beast weight wise compared to other steeds but in my humble opinion the importance of being bullet proof to mechanical issues is far more important. Jill, I look forward to seeing you complete the race and having fun doing it! All my best wishes coming your way! Very nice. You are ready for the GDR/Tour. Have the SPOT and GPS played well sitting so close to each other? I know that some people suggest a distance of at least 2 feet to separate them so 'cross-talk' does not interfere with there operation. I like that post. Thanks. You seem to be doing well and keeping it simple..awesome! How sweet is that? You totally miss Pugsley! awh... now I miss Pugsley & I don't even know him. 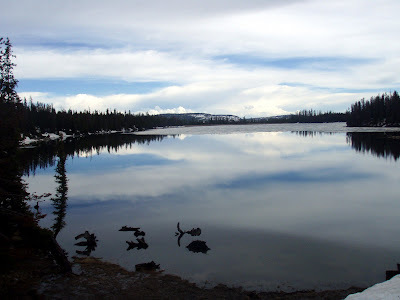 I spent many weeks mapping glacial deposits along the Mirror Lake Highway, and hiked all those dirt roads you explored! It sure is beautiful country. 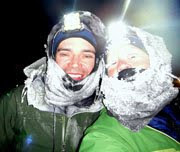 Good luck on the Divide! Made me laugh and laugh. Makes me miss not having a pugsley yet to miss. That's cute. I am sure Pugsley enjoyed the letter. I know I did.